After several years of strong year-over-year sales, the Hyundai engine has transitioned from a raucous roar to a subdued purr. Much of that change can be attributed to a scarcity of utility vehicles in its product line, just when consumers are snapping up SUVs and choosing fewer cars. 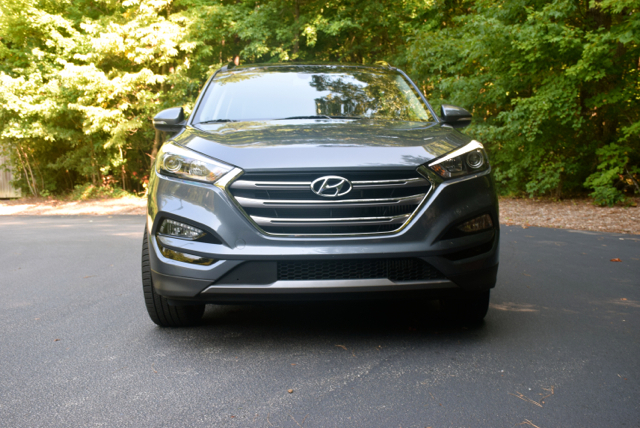 That product scarcity means that the two SUV lines Hyundai currently offers — the compact Tucson and the midsize Santa Fe (standard and stretched wheelbase versions both) — must perform well. Additional models are in the works, but in the meantime, Hyundai has updated the Tucson to begin its third generation. This model competes with the segment leading Honda CR-V as well as the Toyota RAV4, Chevrolet Equinox, Nissan Rogue, Ford Escape, Mazda CX-5, Subaru Outback, Volkswagen Tiguan and the GMC Terrain. The first generation Tucson was sold from 2005 to 2009, the second generation model from 2010 to 2015. The third generation model begins with the 2016 model year and is available in SE ($22,700), Eco ($24,150), Sport ($26,100), and Limited ($29,900) editions. My test model was a 2016 Hyundai Limited FWD model with a sticker price of $31,100. The higher price came by means of carpeted floor mats ($125), a cargo cover ($190), and delivery charges ($895). Choose all-wheel drive and that adds $1,400 to your price across the Tucson line. Moreover, if you choose the Limited AWD with the Ultimate package (i.e., panoramic sunroof, advanced safety features, ventilated front seats and heated rear seats) your final price would run $34,945 before taxes and tags. Price creep is affecting the entire market and budget-minded Hyundai is no stranger to the phenomenon. However, there is one important consolation here: Hyundai models come generously equipped and have the best warranty in the business (please see the specifications box that follows this article). Consider these factors when cross-shopping the Tucson. 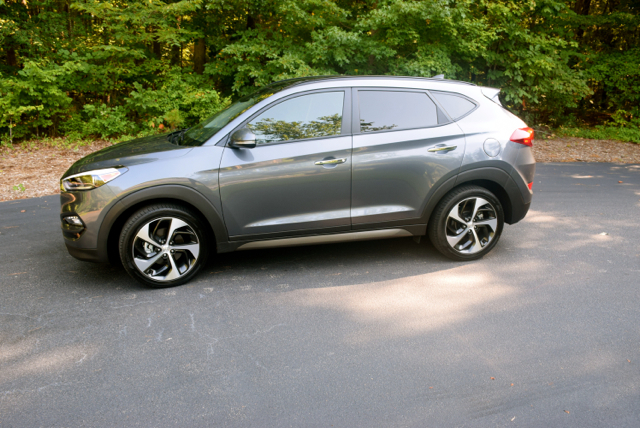 Even just a cursory look at the 2016 Hyundai Tucson reveals a more elegant and polished model. Its visage aligns closely with the Santa Fe, with both models reflecting a more contemporary expression of the brand’s fluidic design language. That language is quite evident up front with a fascia that is at once bold as it is stylized with a pronounced horizontal grille offset by sporty headlamp assemblies with striking LED daytime running light highlights. A sporty lower lip grille opening and a creased hood completes the formulation. The Tucson’s profile is marked by the wheel well trim and pronounced character lines — the first line runs from the front wheel arches to the rear deck and is located between the belt line and the door handles, the second represents a strong indentation toward the base of the doors and just above the rocker panels. At the rear, the Hyundai Tucson is equipped with a rear spoiler, a power liftgate, wraparound tail lamps, rear fog lights and paired chrome exhaust finishers. Sporty wheels and roof side rails complete this small SUV’s complexion. 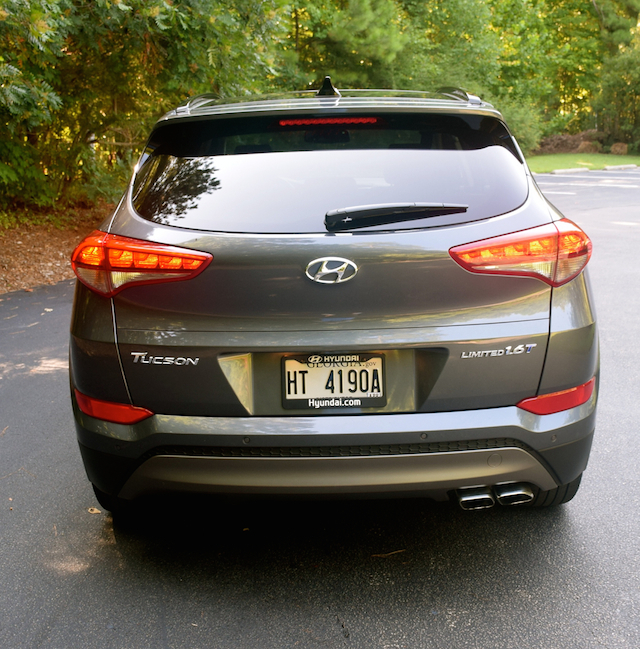 One of my favorite Hyundai features was present in the Tucson — the automatically opening liftgate. This component works when you approach the liftgate from the rear, stop and remain still with your key fob on your person. The Tucson senses your presence, slowly beeps four times and then the liftgate rises automatically. 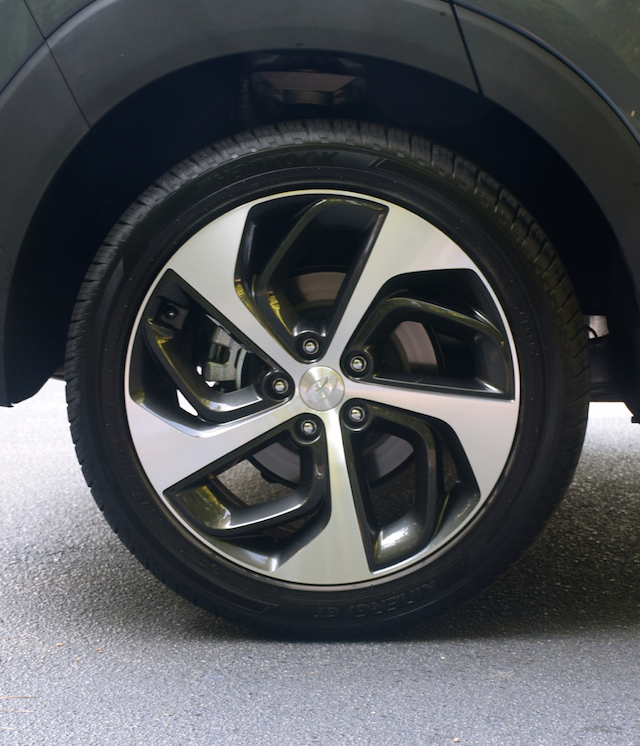 There is no need to swish your foot under the rear bumper ala the Ford Escape or fumble for your keys — you can do this effortlessly. Alas, only the Sport and Limited trim has this feature. For 2016, Hyundai made some powertrain changes, although the base 2.0-liter, four-cylinder engine remains. The base engine makes 164 horsepower and 151 foot-pounds of torque, and comes paired with a 6-speed automatic transmission. It is the engine of choice for both the front- and all-wheel drive versions of the Tucson SE. Hyundai discarded the larger 2.4-liter four-cylinder engine in favor of a 1.6-liter, turbocharged four-cylinder engine. The new engine, also available on the midsize Sonata sedan, makes 175 horsepower and 195 foot-pounds of torque. That compares to the 182 horsepower and 177 foot-pounds of torque the 2.4-liter naturally aspirated engine offered. The turbo is the standard engine for the Eco, Sport and Limited editions. The powertrain pairing for the turbo engine brings in a 7-speed dual-clutch transmission. The advantage here is that the transmission provides rapid shifts between gears for a more sporty feel. The combination has also been tweaked in the Eco edition to help this crossover deliver a competitive 33 mpg on the highway for a 10 percent mileage improvement over the standard model. Notably, there are not too many dual-clutch transmissions on the market, most certainly not amongst crossovers. As is common for most media fleet vehicles, usually top-of-the-line editions are presented for the test drive. Consequently, reviews are often skewed toward the models that few consumers will choose, mostly for price reasons. But the one thing about Hyundai is that even base models share many of the features found elsewhere in the model line. For instance, all models come with alloy wheels, power accessories, a rearview camera, a tilt and telescopic steering wheel, an adjustable driver’s seat, a touchscreen audio system, and air conditioning. 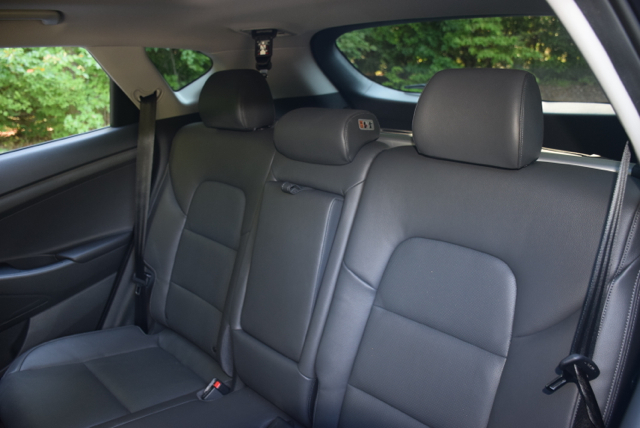 The front bucket seats are comfortable and supportive; the rear seat can hold three with relative ease. Move up to the Eco model and the front and rear fascia gain a more premium look. LED daytime running lights and halogen front fog lights are included, the side mirrors add turn-signal indicators, roof rack side rails are standard, and the driver’s seat gets lumbar support. The Sport model brings in larger wheels, the hands-free smart liftgate, push-button start, heated front seats, and important safety features such as blind spot detection with rear cross-traffic alert, and lane change assist. Choose the Limited and your Tucson receives everything this model has to offer: exterior chrome embellishments, a shark-fin antenna, leather seating surfaces, a power front passenger seat, an 8-inch touchscreen navigation system, an 8-speaker premium audio system, dual-zone climate control, an upgraded instrument panel, Blue Link telematics, and premium door sills. If you forget that you’re driving in a mainstream vehicle when behind the wheel of most any Hyundai vehicle, that’s understandable. The automaker has long sought to provide premium features to its model line, giving it a definite mainstream+ feel inside and out. From the driver’s perspective, the cabin folds out perfectly. All controls are within reach, canted toward the driver and easy to decipher. Some car interior layouts are almost a mess with too many switches and knobs to work with. But in the Tucson, you have a center stack that is clean and sensibly arranged with color display above the climate control. At the base of the stack 12-volt outlets, an auxiliary input port and USB port are neatly arranged with an open compartment large designed to house your smartphone. To this day I still find that some manufacturers consider smartphones an afterthought — and it shows as the only place to house them is on top or inside the covered center storage compartment. In like manner, you may find that only a cup holder is suitable for the phone. Hyundai is also especially adept at creating useful storage compartments. For example, each door has generous storage with large drink holders present. 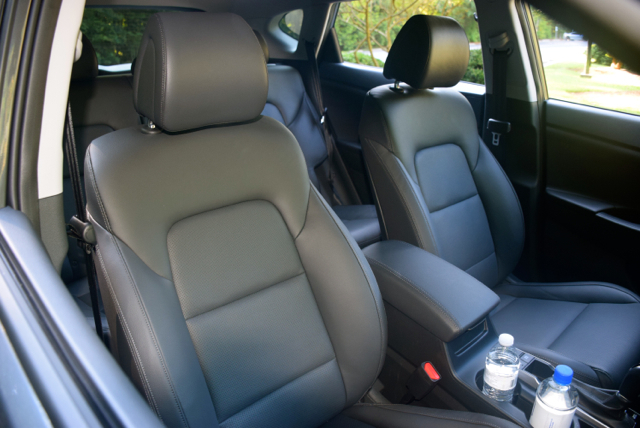 Moreover, growing families should find the rear seat ideal for their needs. The two outboard seats can hold a car or booster seats with the center position folded down to provide the drink holders. The rear seats, by the way are reclinable, tilting slightly to allow the rear passengers to relax. On the road this turbo provided the necessary kick to show that it means business. As is common to this type of forced induction scheme, slight hesitation is noted, what becomes most apparent when you want to floor it. It can seem like an eternity when you have only seconds to spare — a disconcerting feeling that some people refuse to utilize. 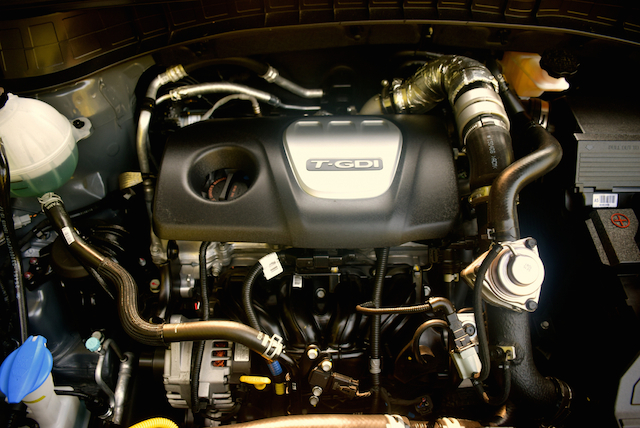 Nevertheless, the little four is a potent engine and is especially juiced for highways. You will have no trouble passing as you zip down the boulevard. Most crossovers are not known for exceptional handling and the Tucson is in the middle of the pack. Generally speaking, the all-important NVH — noise, vibration and harshness — has been successfully managed. Braking is enhanced in the all-wheel-drive model as it has active cornering control, what mitigates understeer and cornering performance by braking the inside rear wheel and sending more torque to the outside rear wheel. So, will the 2016 Hyundai Tucson meet all the requirements for a shopper in the small crossover segment? It should and then some — with generous standard features and equipment not offered elsewhere (i.e., the automatic power liftgate, reclining rear seat, and a right knee pad) — the Tucson has an important edge and a compelling reason to purchase one in a crowded and highly competitive sector. 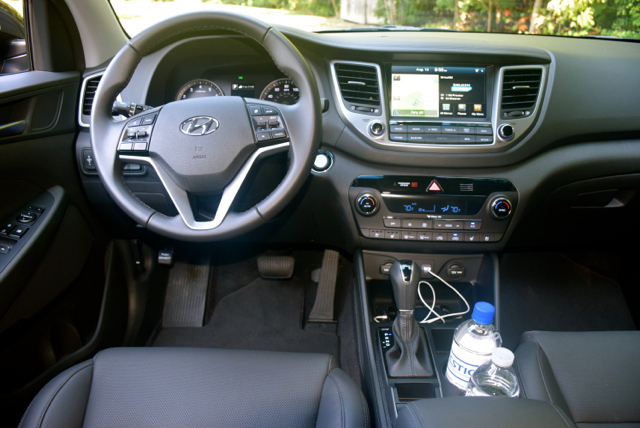 2016 Hyundai Tucson photos copyright Auto Trends Magazine.